Industrial conglomerate Loews Corp. will pay a second-quarter dividend of $0.0625 per share, the same rate it's paid for the last seven years, the company announced yesterday. Loews Corp. is a holding company; its principal subsidiaries are CNA Financial Corp., a 90%-owned subsidiary; Diamond Offshore Drilling, a 50.4%-owned subsidiary; Boardwalk Pipeline Partners, a 55%-owned subsidiary; HighMount Exploration & Production, a wholly owned subsidiary; and Loews Hotels, a wholly owned subsidiary. The board of directors said the quarterly dividend is payable on June 14 to the holders of record at the close of business on June 3. Loews has paid a dividend quarterly since 1993 and over that period has split its stock three times, the last time being in 2006. The regular dividend payment equates to a $0.25-per-share annual dividend yielding 0.5% based on the closing price of Loews' stock on May 14. L Dividend data by YCharts. 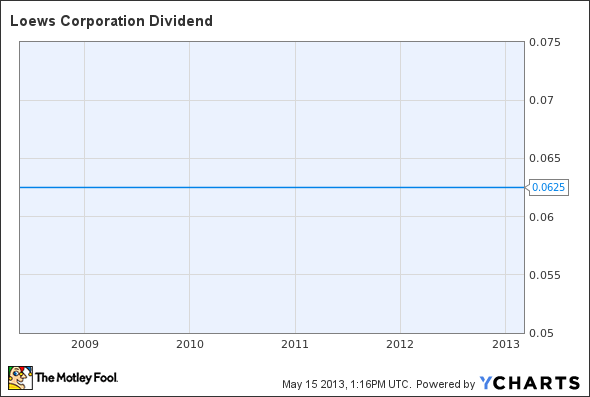 The article Loews Corp. Maintains Steady Dividend originally appeared on Fool.com. Fool contributor Rich Duprey has no position in any stocks mentioned. The Motley Fool recommends Loews. The Motley Fool owns shares of Loews. Try any of our Foolish newsletter services free for 30 days. We Fools may not all hold the same opinions, but we all believe that considering a diverse range of insights makes us better investors. The Motley Fool has a disclosure policy.